What role does copper have to play in the green technologies of today and tomorrow? Lots! Copper is second only to silver as a conductive element, and being less expensive than silver, it’s the metal of choice for most electrical wiring applications. More than 60% of all copper is used in electrical wiring. Recent trials at the Fraunhofer Institute for Solar Energy replaced the silver used in traditional solar cells with less-expensive copper and nickel, and found that the copper-based cells were more than 20% more efficient than the silver. What’s more, solar cells made with copper technology proved to be much more stable at temperatures that cause traditional silver cells to degrade. So, for the same cost, using copper you can make more solar panels, that are more efficient at converting sunlight to electricity, and that last longer. Win, Win, Win. Here’s a fact that’s so basic you may never have thought about it before. Other than solar, whether it’s fueled by coal or diesel or natural gas, nuclear, hydroelectric, wind, or tidal, all electricity is generated the same way: by rotating a coil of conductive copper wire inside a magnetic field (or vice versa). The fuel just provides the power to spin the coil. With coal, gas and nuclear plants the fuel heats up water, turning it into steam, which spins a turbine that turns a huge copper coil that generates electricity. With wind farms and hydroelectric dams, the wind or rushing water turns the turbine directly. What that means is that copper is at the heart of every electric generator. And as we decentralize our electricity production, moving from monolithic power plants to more broadly distributed wind, tidal and micro-hydro, we need that much more copper to make it possible. A single large wind turbine — just one, in a wind farm that might have hundreds — requires more than four tons of copper. Incidentally, Alaska has amazing potential for wind-generated energy. The US Department of Energy’s Wind Atlas of the United States classifies most of the Alaska Peninsula as either outstanding or superb for wind power, but almost all of coastal Alaska and interior mountain ridge lines have great potential. The 11 Fire Island turbines that CIRI brought online in September of 2012, and Kodiak Electric’s Pillar Mountain Wind Project, are just some of the first of a new era of clean energy for Alaska. There are more and more electric vehicles on the road these days. While they’re no match for conventionally fueled vehicles in all applications, with their roughly 80 mile range and 3–4 hour charging time, current models can be ideal vehicles for commuting, getting groceries and zipping about town. And they’re improving every year. Moving to electric vehicles is another way in which we can reduce our collective foreign fuel bill, as well as our emissions. Of course, electric vehicles need copper — about twice as much copper as a conventional vehicle. 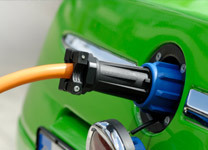 If we aim for an admittedly optimistic goal of an 85% electric fleet in the year 2050, it’s estimated that the auto industry would generate about 20% of global copper demand. Presumably it would be a slow ramp-up rather than happening overnight. But that increased demand has to be met by increased production, or decreased use elsewhere, and there are few unnecessary uses of copper today. As it can easily take 15 years or more to take a mineral deposit from discovery to active extraction, if going to green energy requires more copper, we have to plan ahead. That’s one reason that projects like Pebble are so important — they provide the resources for these emerging technologies. Without an increase in copper production, market forces could drive the price of copper up to the point where it would no longer be cost effective to develop wind energy or electric vehicles.